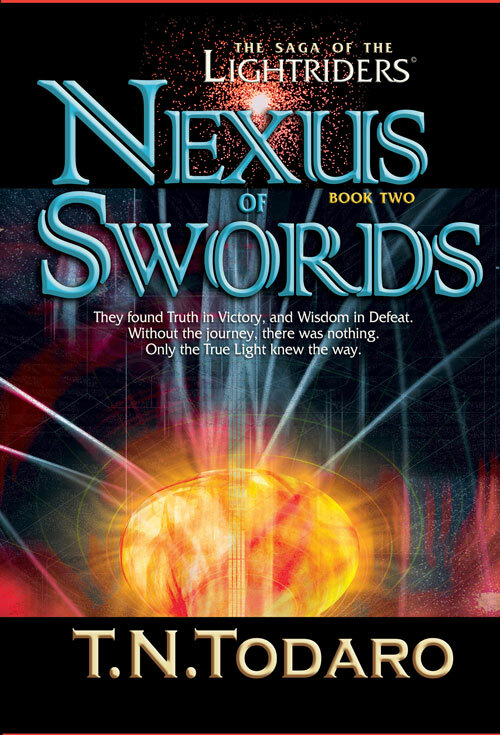 The Nexus of Swords© continues The Saga of the Lightrider as the Demon Wielder sets a deadly trap for apprentice Lightrider Jonas Goodwill that would not only mean death for him, but the destruction of the C’Hamarande Protectorate. Imagine searching the stars for the most important person in your life, only to find yourself drawn into a deadly trap set by a Demon Wielder obsessed with your death and the destruction of the universe as you know it. As seen through the eyes of Jonas Goodwill, an apprentice Lightrider with genetically-evolved magical powers, Nexus of Swords is a science fiction and fantasy epic that takes place in the universe of the Lightriders, where the Wizzen (wizard-engineers) combine magic and science with religion. Light is a tool, a weapon, and perhaps a god. As Jonas completes his studies at the Academa on the Rings of M’rrr — the school in the stars where science and magic are taught and improved upon — he learns that his mentor, B’Obadine Pelucidor, has been kidnapped. The young Lightrider travels the stars in search of him, where he finds himself pursued by the WAM, a mysterious Order, and minions of the Demon Wielder, a legendary evil struggling to free itself from its eternal prison and end the dominion of Light. Jonas journeys to the water world of Acupulaku, where he is joined by a band of students — some trying to protect him, others with a different agenda. They battle harpies, mutant experiments, and reptilian guards while searching for B’Obadine, only to find someone Jonas believed dead. As Jonas evolves genetically and spiritually into the True Light, he has a vision of a mysterious deep-space anomaly, dubbed the Nexus of Swords, which destroys a wing of Peacekeeper lightships. He forms an alliance with the Commander of the WAM, a Grand Wizzen, and a young enchantress, then journeys with the WAM fleet to the Nexus. He faces a deadly dilemma: should he rescue B’Obadine from the core of the anomaly, or destroy it, causing the death of the most important person in his life? He encounters a horrific evil and a traitor who is dangerous beyond imagination. Not only to the True Light, but to all United Sentient Beings. The Saga of the Lightriders chronicles the epic conflict between the Protectors of the Infinite Light and the Demon Wielder, an ancient evil struggling to free itself from its eternal prison in the Vulpecula Anomaly and destruction of the Lightriders. The saga is seen through the eyes of Jonas Goodwill, an apprentice Lightrider. The Lightriders are a legion of Wizzen [wizard engineers] who use science and genetically-evolved magic to engineer a better life for all United Sentient Beings in a universe where Light is a tool, a weapon, and perhaps a god.